Boomerang, a leading supplier of packaging products in Houston, offers a full line of strapping tools from leading manufacturers in the industry. We are committed to providing each customer with the highest quality strapping tools, and carry only the top manufacturers in the industry. Our expert staff will respond quickly to your requests, and provide you with an effective solution to your packaging needs. We are proud to work with a broad range of customers, from large international companies to small local businesses, and treat each customer with the same individualized attention. A leading supplier of packaging products in the Houston area, Boomerang’s staff is committed to providing each customer with the highest quality in packaging supplies and materials for their packaging needs. Boomerang is a leading supplier of packaging products in Houston, offering a complete line of plastic strapping tools from the top manufacturers in the industry. Battery-powered Tensioners & Sealers – Used for medium to high volume operations, battery-powered tools provide uniform tension throughout the strap and are easier to use than manual tools. Pneumatic Tensioners & Sealers – Used for large or compressible packages and higher volume operations, pneumatic hand tools provide uniform and precise tension throughout the strap. These tools are used for high production volumes requiring heavy strapping. They are also effective for applications where the seal is in an awkward place on the package. Manual Tensioners – Manual tensioners are used to bring the strap to the desired tension with minimal interruption, effort and waste. They are used for medium to low volume production applications. 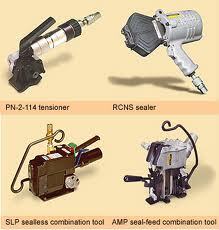 Manual Sealers – These provide positive sealing action with minimal effort. Manual sealers are light and durable. The seal locks the strap ends into a high strength joint. Specialty Tools – Special tools to provide strapping for custom and odd-shaped packages. Boomerang Packaging is committed to providing every customer with the most effective strapping tool for their application. Each customer is served with total commitment and excellent customer service, whether they are an international company, or small, local manufacturer. Our product line represents the top manufacturers in the industry, so that you know you are buying the best from us. We are committed to your satisfaction. It’s all in our name- we work hard for you, so that you keep coming back- Boomerang!